The Tank Museum at Covington, England, holds the world’s finest collection of armored vehicles from 26 countries. If armored vehicles are your interest, the Tank Museum at Bovington Camp, Dorset, is your holy grail. This cavernous museum, measuring 50,000 square feet, holds the world’s finest and most comprehensive collection of over 250 armored vehicles from 26 countries. The Army base here is still Great Britain’s armor training center, so you’ll often see tanks swirling around in the dust on the nearby hills, or hear them off in the distance firing at targets. With exhibits dating from 1909 to the present day, the Tank Museum tells the story of this huge, clanking, British invention and the scientific and technological developments that have marked the evolution of bigger, better, faster, and more powerful tanks. Many of the vehicles at Bovington are rare or the only remaining examples of their type. Some of the museum’s tanks are in full working order and draw large crowds every year to the “Tanks in Action” and “Vehicle Mobility Displays” held near the museum between April and September. Bovington is literally the home of the tank—this is where the first tank regiments were mustered and where the gigantic metal beasts were tested in 1916 before being sent off to World War I. The museum originated in 1919 when some of the tanks that had returned from France were fenced off to provide the young Tank Corps soldiers with examples of their heritage. The indoor museum was established in 1947, and the collection expanded with captured World War II enemy armor acquired from battlefields and factories. My guide was David Fletcher, the world’s leading expert on armored warfare and a walking encylopedia on armored vehicles. We started off in the Tank Story Hall and wandered among some of the museum’s finest exhibits. A few tanks that stand out are one of the very last duplex-drive Sherman tanks, modified for amphibious operations like D-Day—surrounded by a huge waterproof canvas screen to make it float. Although big and ugly, military tanks have a special attraction for fans of the steel behemoths. 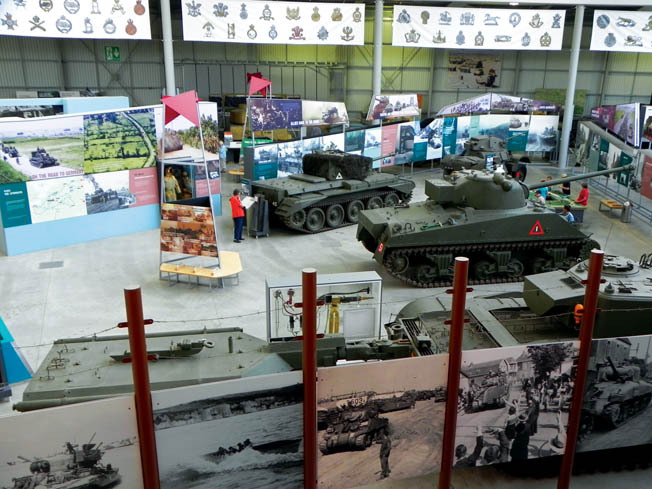 Here the Bovington Tank Story Hall provides, in photos and real examples, the history of armored warfare. Other classic World War II icons include the German Panzerkampfwagen II, III, IV, V, and VI models; a Soviet T-34/85-11 and KV-1B; a British Mark IV Churchill VII; and a Sherman Firefly––an “up-gunned” U.S. tank with a 17-pounder gun. Probably the most visited tank at the museum is the legendary German Tiger. With a powerful 88mm gun and thick armor, this was much feared by the Allies. The museum’s Tiger I was abandoned by its crew after being hit by a Churchill tank of the 48th Royal Tank Regiment. This Tiger’s battle scars are still evident—deep scratches and gouges on the main gun and turret, where a round from the Churchill tank clipped the barrel and wedged itself in the turret mechanism. There is also another Tiger, an Sd Kfz 182 Panzerkampfwagen VI Ausf B––known as the Tiger II, Royal Tiger, or King Tiger. The Trench Experience is a World War I diorama of a German trench being attacked by a tank, complete with noisy machine guns and battle smoke. Emerging in the World War I and Interwar galleries are a number of interesting and rare early tanks. The World War II Discovery Center displays 77 tanks and armored vehicles. A highlight of this gallery is the A34 Comet I Tank Cruiser, which only appeared in the final months of the war. Equipped with a 17-pounder gun, this was the only British tank that could go round for round with the big German tanks. U.S. armor displays include an M26 heavy Pershing Tank, the successor to the Sherman tank; a rare M4A4 Sherman V flail tank that was used to clear mines; a GMC DUKW Amphibian, one of the war’s most famous military vehicles; and a “Weasel” Amphibious Carrier M29C, that served well in the Pacific, Italy, and the European Theater. The list of exceptional German armor includes a rare SdKfz 234/3 Schwerer Panzerspähwagen, a technically advanced eight-wheeled armored car used for close-range fire support; a SdKfz 142 Sturmgeschütz 40 Ausf G assault gun; an SdKfz 173 Jagdpanther tank destroyer; a Jagdpanzer 38 tank destroyer; and a Sd Kfz 161 Panzerkampfwagen IV Ausf D, weighing 18 tons and mounting a 75mm gun. This was the workhorse of German panzer forces. The behemoth SdKfz 186 Jagdtiger was the most powerful tracked combat weapon of World War II; only 88 of these self-propelled guns were produced. With a mounted 128mm Pak 44 antitank gun, the ammunition was so heavy that it took two loaders to feed the gun. This particular Jagdtiger saw action in the final few months of the war and was captured near Paderborn, Germany. Tags Allies, british military history, Churchill Tank, Cromwell Mk VIII, D-Day, DUKW, European Theater, Jagdpanzer, KV-1, Mark IV, Normandy, Operation Overlord, Panzer VI Tiger, Sherman Tank, Sturmgeschütz, T-34 tank, Tank Corps.